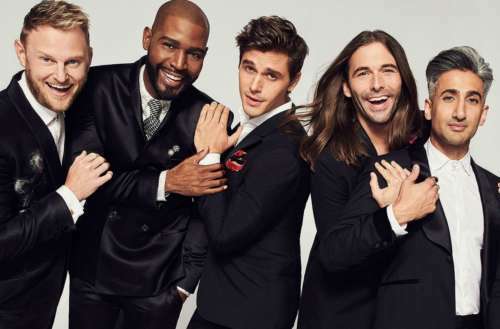 A first glimpse of the Fab 5 of Netflix’s Queer Eye for the Straight Guy reboot was released today, and many are underwhelmed by what they’ve seen. The cast is slightly racially diverse, sure, but it’s still just five cisgender gay men. While it’s great the show included some gay men who aren’t white, we’re disappointed they didn’t also include other members of the LGBT community. The word “queer” today includes so much more than just male-born gay guys. In 2017, queer means a lot more than just gay. Back in 2000, the word “queer” was a synonym for gay, but the word has since become an umbrella term for our diverse LGBTQ community. All the letters in the LGBTQ acronym need more visibility in the media, and the Queer Eye reboot could have been the perfect opportunity for Netflix to provide it. One of the more exciting things about the reboot is that the new Fab 5 are facilitating complicated conversations with the straight men they’re tasked to makeover, all of whom hail from red states. But wouldn’t it be great to have lesbians, bisexuals, trans and gender non-binary people participate in those conversations as well? Some of the most contentious and important battles our LGBT community is facing involve the rights of our trans sisters and brothers. Wouldn’t it be amazing to have a trans person in the cast to initiate these important conversations? Relationships are a huge aspect of the upcoming Queer Eye reboot. Not just between the Fab 5 and their right-wing makeover subjects but between these five gay men as well. But while portraying strong relationships between gay men is important, haven’t we been there and seen that already? Not only did the original Queer Eye do that, but we see it with shows like Will & Grace, Queer as Folk, Looking and, of course, RuPaul’s Drag Race. Actor Daniel Franzese brought up another great point: the cast’s lack of body diversity. Franzese suggests he might not be watching Queer Eye, and we’re sure many others in our queer community won’t be either, because they don’t see themselves represented. This was a missed opportunity by a trailblazing company like Netflix to create more revolutionary content for the LGBTQ community.